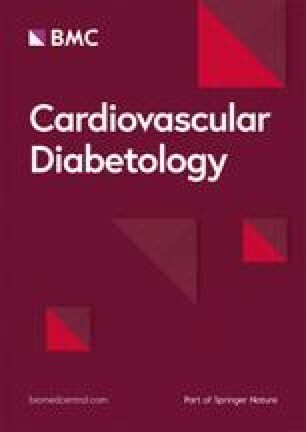 To investigate the effect of visit-to-visit fasting plasma glucose (FPG) variability on the left cardiac structure and function in patients with type 2 diabetes mellitus (T2DM). In this prospective cohort study, 455 T2DM patients were included and follow-up for a median of 4.7 years. FPG measured on every hospital visit was collected. FPG variability was calculated by its coefficient of variation (CV-FPG). Left cardiac structure and function were assessed using echocardiography at baseline and after follow-up. Multivariable linear regression analyses were used to estimate the effect of FPG variability on the annualized changes in left cardiac structure and function. Subgroup analysis stratified by mean HbA1c levels (< 7% and ≥ 7%) were also performed. In multivariable regression analyses, CV-FPG was independently associated with the annualized changes in left ventricle (β = 0.137; P = 0.031), interventricular septum (β = 0.215; P = 0.001), left ventricular posterior wall thickness (β = 0.129; P = 0.048), left ventricular mass index (β = 0.227; P < 0.001), and left ventricular ejection fraction (β = − 0.132; P = 0.030). After additionally stratified by mean HbA1c levels, CV-FPG was still independently associated with the annualized changes in the above parameters in patients with HbA1c ≥ 7%, while not in patients with HbA1c < 7%. Visit-to-visit variability in FPG could be a novel risk factor for the long-term adverse changes in left cardiac structure and systolic function in patients with type 2 diabetes. Trial registration ClinicalTrials.gov (NCT02587741), October 27, 2015, retrospectively registered. The online version of this article ( https://doi.org/10.1186/s12933-019-0854-9) contains supplementary material, which is available to authorized users. Type 2 diabetes mellitus (T2DM) increases the risk for cardiovascular diseases (CVDs), including heart failure and cardiac dysfunction, which is the leading cause of diabetes-related morbidity and mortality . T2DM can contribute to the adverse changes in cardiac structure and function . Cumulative exposure to hyperglycemia and higher insulin resistance are risk factors for adverse left ventricle (LV) remodeling and subclinical LV dysfunction [3, 4]. Accumulate evidences shown that glycemic variability, irrespective of the magnitude of hyperglycemia, was an independent risk factor for CVDs , ischemic stroke , cardiovascular mortality  and all-cause mortality [8, 9, 10, 11] in T2DM patients. However, no study has examined the effects of visit-to-visit glycemic variation, determined by coefficient of variation of fasting plasma glucose (CV-FPG), on the left cardiac structure and function. Therefore, the objective of this study was to examine the association of visit-to-visit FPG variability with long-term changes in left cardiac structure and function among patients with T2DM, irrespective of HbA1c and other conventional risk factors. This is a prospective observational cohort study conducted in our hospital between January 2013 and June 2018. A cohort of T2DM patients who admitted in hospital for glycemic control were enrolled from January 2013 to December 2014. Participants finished the final visit from January 2018 to June 2018. T2DM was diagnosed according to the 1999 criteria of the World Health Organization (WHO) . Patients with overt heart failure with a New York Heart Association (NYHA) functional classification of III and IV, left ventricular ejection fraction (LVEF) less than 50%, history of primary cardiomyopathy disease, severe valvulopathy and chronic atrial fibrillation were excluded. Ethics approval was obtained from the third affiliated hospital of Sun Yat-sen University Network Ethics Committee. Informed consent was obtained from all participants. Demographic and clinical characteristics, including age, gender, body height, weight, systolic blood pressure (SBP), diastolic blood pressure (DBP), lifestyles (smoking status and alcohol consumption), comorbidity, duration of diabetes, diabetes therapy (oral hypoglycemic drug, insulin injection, or both) and medications were obtained via paper-based case report forms. The European Society of Hypertension (ESH) and of the European Society of Cardiology (ESC) defined categorical hypertension as a blood pressure ≥ 140 mmHg systolic or ≥ 90 mmHg diastolic or current use of antihypertensive medication . Urinary albumin was measured in three consecutive urine collections using a turbidimetric immunoassay and expressed as the urinary microalbumin/creatinine ratio (UACR). For biochemical analysis, blood samples were drawn after 8-h overnight fasting and examined by HITACHI 7180 automatic-analyzer. The biochemical parameters included blood urea nitrogen, creatinine, uric acid, triglycerides, total cholesterol, high density lipoprotein cholesterol (HDL-C), and low density lipoprotein cholesterol (LDL-C). Dyslipidemia was defined as total cholesterol ≥ 6.22 mmol/L (≥ 240 mg/dL), and/or serum triglyceride levels ≥ 1.7 mmol/L (≥ 150 mg/dL), and/or LDL-C ≥ 4.14 mmol/L (≥ 160 mg/dL), and/or HDL-C < 1.04 mmol/L (< 40 mg/dL), and/or use of lipid-lowering medications . Estimated glomerular filtration rate (eGFR) was calculated using the Modified Diet in Renal Disease (MDRD) formula (National Kidney Foundation Calculator for Healthcare Professionals). Fasting and postprandial C-peptide/insulin were determined by radioimmunoassay. The homoeostasis model assessment of insulin resistance (HOMA-IR) was calculated according to the formula: Fasting insulin*FPG/22.5 . Clinical following-up was arranged every 1–3 months (depending on the glycemic control status). Anthropometric information, medications, self-monitoring of blood glucose, hypoglycemia events and adverse events were recorded at every follow-up visit. FPG and 2-h postprandial blood glucose (2 h-PBG) were assayed every 1–3 months to assess the glycemic control status by the glucose oxidase method. HbA1c was measured quarterly by D-10 hemoglobin Testing Program (Bio-Rad) with high performance liquid chromatography (HPLC). Comprehensive standardized echocardiography was performed to assess the cardiac structure and function at the inception and final visit of the study. The anti-hyperglycemic therapy and the lifestyle intervention have been evaluated by specialist physicians based on the glycemic control status during the following-up visits. Participants with at least ten FPG determinations measurements during the study were finally included for glycemic variation calculation. For each participants, the intra-personal mean and standard deviation (SD) of all recorded FPG measurements were calculated. The CV-FPG was the ratio of the SD over the mean FPG, and the CV-FPG was considered as measure of FPG variability. Considering that the frequency of individual visits could influence the calculation, the CV-FPG was further adjusted by dividing by the square root of the ratio of total visits divided by total visits minus 1 [6, 9, 16]. The CV of 2 h-PBG and HbA1c were also calculated respectively. Transthoracic echocardiography (IE33 echocardiography system) were performed on all participants according to the recommendations of the American Society of Echocardiography  by two trained, registered cardiac sonographers. The echocardiographic methods were designed to be as similar as possible for each individual at the baseline and follow-up time-points, with minor changes in measurements. Left atrium (LA) size was measured at the end of LV systole, when the LA chamber was at its greatest dimension. The left ventricular internal end-diastole dimension (LVDd), interventricular septum (IVS) and left ventricular posterior wall thicknesses (LVPW) were measured at the end of LV diastole, acquired in the parasternal long-axis view at the level of the mitral valve leaflet tips. LV mass index (LVMI) was measured from M-mode LV mass measurement using the Derveux corrected formula and indexed to body surface area; LV systolic function was assessed by calculating LVEF with the modified Simpson biplane method. By the pulsed wave Doppler in the apical 4-chamber view, LV inflow was obtained (peak early (E) and late (A) diastolic velocities and E/A ratio were obtained). Peak early diastolic mitral annular velocity (e′) was measured at the junction of the interventricular septum with the mitral annulus in the apical 4-chamber view by pulsed-wave tissue Doppler imaging (TDI), and the septal E/e′ ratio was calculated. Database management and statistical analysis was performed by using SPSS 22.0 for Windows (SPPS Inc, Chicago, IL, USA). Descriptive statistics are presented as mean ± standard deviation for continuous variables or as numbers and percentages for categorical variables. All patients were grouped into quartiles of CV-FPG (Q1 = the first quartile; Q2 = the second quartile; Q3 = the third quartile; Q4 = the fourth quartile). Continuous variables were compared by ANOVA test, while categorical variables were compared using the Pearson Chi square test. 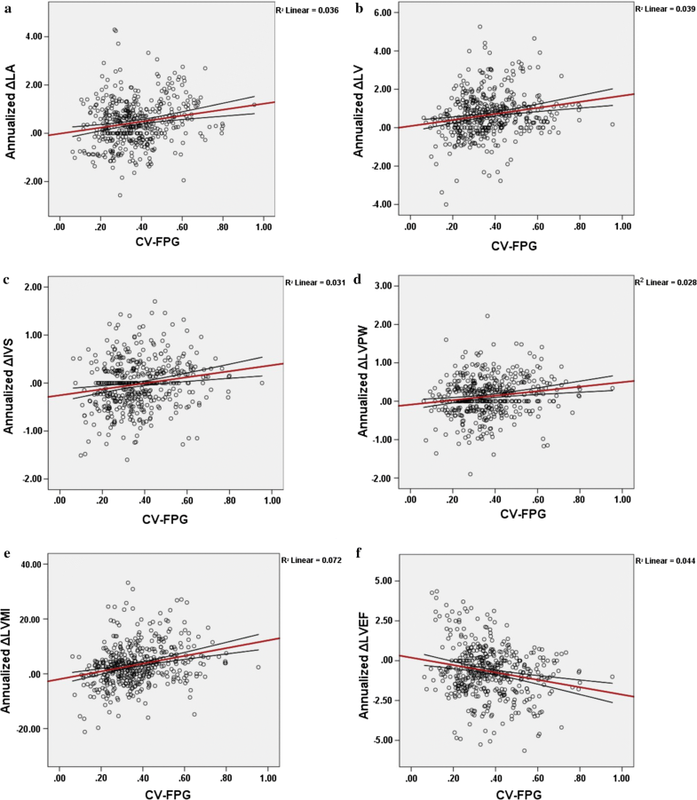 Pearson Chi square tests for trend and Spearman rank correlation tests were used to test for a relationship between the parameters of cardiac structure and function and values of CV-FPG. Univariate linear regression was performed to assess the non-adjusted relationships between FPG variability and annualized change in cardiac structure and function. After that, two multivariate linear regression models were performed to adjust the confounding factors. The first model was adjusted for age, gender, body mass index (BMI), diabetes duration, cardiovascular disease, hypertension, TG, HDL-C, LDL-C, smoking status, alcohol intake, medications, HbA1c, CV-HbA1c, PBG, CV-PBG, hypoglycemia rate and the number of FPG measurements. The second model was additionally adjusted for the corresponding mean FPG to investigate whether the association was independent of mean FPG. To determine whether the glycemic control status affect the relationship between FPG variability and cardiac structure and function, subgroup analysis was performed based on mean HbA1c levels (< 7.0% and ≥ 7.0%). A 2-tailed P value < 0.05 was considered to indicate statistical significance. From January 2013 to December 2014, 721 (420 men and 301 women; aged 30–80 years) patients agreed to enroll in the study. During a median of 4.7 years of follow-up, a total of 128 participants who did not finish the finial echocardiography examination were excluded from the study. Another 121 participants with less than ten FPG measurements during the study were also excluded. 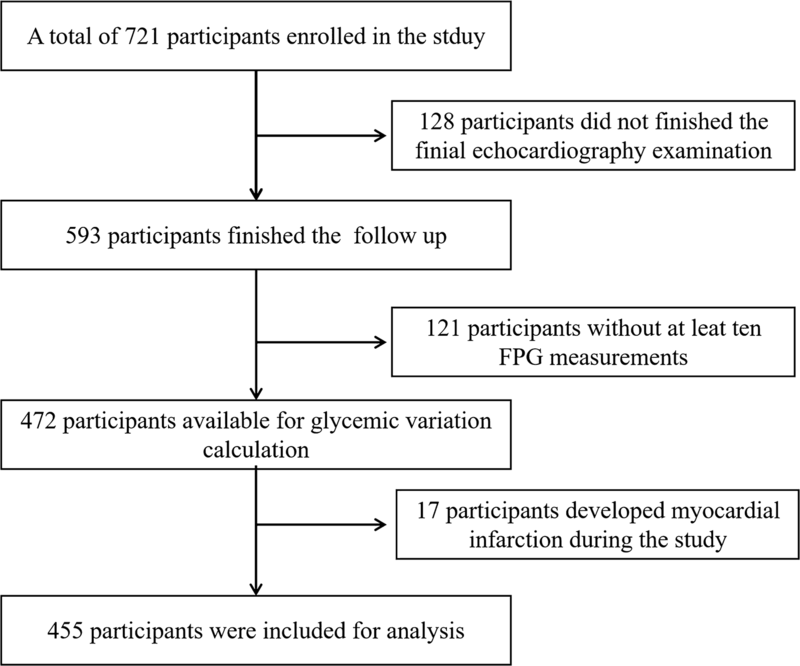 In addition, we also excluded 17 individuals who developed myocardial infarction during follow-up period. Finally, the remaining 455 participants (218 men and 235 women; mean age was 60.11 ± 12.73 years) were eligible for analysis (Fig. 1). The median of diabetes duration of the study cohort is 6.3 (2.3-10.4) years, with a mean HbA1c of 7.01 ± 1.05%. The mean FPG was 7.24 ± 1.54 mmol/L, and the CV of which is 39.01 ± 14.96%. Table 1 showed the baseline sociodemographic and clinical factors in subjects grouped according to quartiles of CV-FPG. The values of CV-FPG ranged from 6.26 to 26.56% in Q1 subjects, 26.56 to 34.99% in Q2 subjects, 34.99 to 44.89% in Q3 subjects, and 44.89 to 95.40% in Q4 subjects. The diabetic duration, mean HbA1c, CV-HbA1c, CV-PBG, proportion of insulin injection, and proportion of calcium channel blocker intake varied among groups (P < 0.01). However, no significant differences were observed in the other baseline profiles among subjects with different CV-FPG quartiles. The baseline echocardiographic parameters of the whole cohort manifested as normal left cardiac structure and systolic function, along with mild diastolic dysfunction. Over a median of 4.7-year follow-up, adverse changes could be observed in most of the parameters of left cardiac structure and function, as showed in Additional file 1: Table S1. After further stratified by quartiles of CV-FPG, measures of left cardiac structure and function were showed in Table 2. The baseline LVDd, LVMI, LVEF and A velocity varied among subjects with different CV-FPG quartiles, while no differences were observed in LA, IVS, LVPW, E/A ratio and E/e’ ratio. In order to reduce the impact of baseline inconsistency, we therefore use annualized changes of echocardiographic parameters to evaluate the effect of CV-FPG on left cardiac structure and function, as shown in Fig. 2. After a median of 4.7-year follow-up, elevating trends from Q1 to Q4 were showed in the annualized change of LA (P < 0.001), LVDd (P < 0.001), IVS (P < 0.001), LVPW (P = 0.002) and LVMI (P < 0.001), while declined trend was observed in the annualized change of LVEF. However, no significant differences were detected in annualized changes of parameters of LV diastolic function (E/A ratio and E/e′) among participants stratified by CV-FPG quartiles (P > 0.05). Univariate linear regression analysis demonstrated that annualized changes of LA (P < 0.001), LVDd (P < 0.001), IVS (P < 0.001), LVPW (P < 0.001), LVMI (P < 0.001), LVEF (P < 0.001) were significantly related to values of CV-FPG (Fig. 3 and Table 3). When further adjusting for age, gender, BMI, diabetes duration, cardiovascular disease, hypertension, TG, HDL-C, LDL-C, smoking status, alcohol intake, medications, mean HbA1c, CV-HbA1c, PBG, CV-PBG, hypoglycemia rate and the number of FPG measurements (model 1), CV-FPG remained independently associated with annualized changes of LVDd (P = 0.044), IVS (P = 0.001), LVPW (P = 0.045), LVMI (P < 0.001), LVEF (P < 0.001). Further adjusting for mean FPG showed that CV-FPG was still significantly related to these cardiac parameters (LVDd, IVS, LVPW, LVMI and LVEF) (model 2). No significant relationship were found between left cardiac diastolic function parameters (E/A ratio and E/e′ ratio) and the value of CV-FPG neither in univariate or multivariate linear regression analysis (P > 0.05). Correlation between annualized changes of left cardiac structure and function and CV-FPG. a Y = − 0.02 + 1.24 * X, R linear = 0.190, R2 linear = 0.036, P < 0.001; b Y = − 0.08 + 1.58 * X, R linear = 0.199, R2 linear = 0.039, P < 0.001; c Y = − 0.25 + 0.63 * X, R linear = 0.175, R2 linear = 0.031, P < 0.001; d Y = − 0.09 + 0.58 * X, R linear = 0.168, R2 linear = 0.028, P < 0.001; e Y = − 1.95 + 14.12 * X, R linear = 0.269, R2 linear = 0.072, P < 0.001; f Y = 0.19 − 2.32 * X, R linear = − 0.209, R2 linear = 0.044, P < 0.001. An reasonable HbA1c level is below or around 7% according to the American Diabetes Association (ADA) and the European Association for the Study of Diabetes (EASD) . In order to reduce the influence of glucose control status, we further performed subgroup regression analysis stratified by mean HbA1c levels (< 7% vs. ≥ 7%), as shown in Table 4. In multivariate liner regression model 1 and model 2, CV-FPG was significantly related with LVDd, IVS, LVPW, LVMI and LVEF in the subgroup of HbA1c ≥ 7% (P < 0.05), but not in the subgroup of HbA1c < 7% (P > 0.05). This study is the first to demonstrate that visit-to-visit FPG variability, represented by CV-FPG, was associated with the subclinical left cardiac remodeling and systolic dysfunction, independently of mean glucose control status and other conventional risk factors. Our finding suggests that visit-to-visit FPG variability can be routinely monitored, and the effect of antidiabetes therapy on glucose fluctuation should be considered in the clinical management of patients with T2DM. Abundant of studies have showed that T2DM was related to various target organ damage and elevated risk of cardiovascular events [19, 20, 21]. In addition, previous studies suggested that T2DM was associated with minute LV systolic and diastolic dysfunction, which might further lead to the progression of diabetic cardiomyopathy [20, 22, 23, 24, 25]. T2DM patients with suboptimal glycemic control have increased aortic stiffness and a higher prevalence of LV hypertrophy, along with lower diastolic and systolic LV longitudinal performance . Subclinical LA structural and functional changes were also observed in T2DM patients with normal left atrial size [27, 28]. In consistent with previous studies, the present study indicated that preclinical left cardiac remodeling and dysfunction had develop in T2DM patients before the occurrence of clinical heart failure [4, 29, 30, 31]. Glucose variability, another factor showing glycemic control abnormality in addition to conventional risk factors, has been reported to be associated with increased risk of complications and mortality in diabetes patients . Independently of mean FPG and HbA1c, previous studies showed that elevated visit-to-visit variability of FPG significantly increased the risk of CVDs and all-cause mortality in patients with T2DM [8, 9]. Glycemic variability assessed by visit-to-visit HbA1c variability was inversely related to Baroreflex sensitivity, as a sensitive indicator of T2DM patients with cardiovascular autonomic neuropathy, independently of the mean HbA1c in patients with T2DM, which has been found to be associated with cardiovascular events . HbA1c variability was independently predictive of all-cause death and composite events T2DM patients with heart failure .The present study provided further evidence that visit-to-visit variability of FPG is independently associated with subclinical echocardiographic abnormalities of LV structure and systolic function before the occurrence of clinical cardiovascular events. In accordance with our findings, especially in patients with HbA1c ≥ 7%, the higher glycemic variability was related to the left cardiac remodeling and systolic dysfunction. An excessively fast glucose-lowering rate, which indicate high glucose fluctuation, could impair LV systolic function in patients with T2DM and CAD . Furthermore, glycemic variability determined with a continuous glucose monitoring system can predict prognosis in patients with acute coronary syndrome without severe diabetes . In addition, accumulated evidence demonstrated that diabetes were associated with cardiac diastolic dysfunction [37, 38, 39] and patients with abnormal E/e′ have higher mortality [40, 41]. In addition, a community-based cohort found that the presence of subclinical LV diastolic dysfunction was a predictor of the incident T2DM . In the present study, the diastolic function was deteriorated in the whole cohort after a median of 4.7-year follow-up, suggesting that subclinical left ventricular diastolic dysfunction gradually developed with the extended duration of diabetes . However, no difference was observed in the annualized changes of both E/A ratio and E/e′ ratio among groups with different quartile of CV-FPG, suggesting no significant effect of glycemic variability on subclinical diastolic dysfunction. Optimized postprandial glucose control was related with improved myocardial/vascular function in well-controlled T2DM patients . In the present study, there was no significant difference in mean postprandial glucose, but increased postprandial glucose fluctuation, assessed by CV-postprandial glucose, with the elevated levels of CV-FPG. However, the CV-FPG was still independently associated with the LV subclinical adverse remodeling and systolic dysfunction after adjusting the postprandial glucose excursions. Elevated insulin resistance was another risk factor for adverse LV remodeling and subclinical dysfunction . However, no difference was observed in the hyperinsulin and insulin resistance among groups with different level of FPG variability in the present study. The mechanisms by which elevated fluctuation of FPG contributes to cardiac remodeling and systolic dysfunction in patients with diabetes are yet to be elucidated. There are several potential explanations. Glycemic fluctuations have been shown to increases oxidative stress [45, 46] and inflammatory cytokines [25, 47], both of which were important pathogenic factors in the development of diabetic complications, including cardiomyopathy [48, 49, 50, 51]. Blood glucose variability can induced oxidative stress by inhibiting AKT signalling path to aggravate cardiac tissue fibrosis , which contribute to the cardiac remodeling and dysfunction. Furthermore, individuals with a higher variability of FPG tend to have a higher prevalence of hypoglycemia and sympathetic dysfunction, and hypoglycemia is associated with the occurrence of atherosclerotic disease , which are associated with cardiac remodeling. It is also important to evaluate the effects of different antidiabetic agents on glycemic variability to attenuate the adverse progression of cardiac structure and function. In a randomized clinical trial, a 16-week treatment of dipeptidyl peptidase 4 inhibitor, vildagliptin, but no pioglitazone, reduced glycemic variability in individuals with T2DM who was inadequately controlled with metformin monotherapy . In addition, the sub-group analysis from the PROLOGUE study showed that adding dipeptidyl peptidase 4 inhibitor, sitagliptin, to conventional antidiabetic regimens for 2 years in T2DM patients attenuated the annual exacerbation in the cardiac dysfunction . Further studies should be designed to investigate the impacts of different hypoglycemic therapies on glycemic variability and subclinical alteration of cardiac structure and function. There are several limitations for our study. First, considering that FPG measurements were obtained from clinical follow-up, the frequency of the FPG measurements varied among patients. Although the effect of the frequency of FPG measurements on variability had been adjusted, the difference in intervals between FPG measurements has not been adequately addressed. Second, we did not assess the relation of diabetic complications with altered LV structure and function. Finally, the observation cohort study can only show the association but not the casualty. In summary, our study demonstrated that visit-to-visit variability of FPG in patients with T2DM was independently associated with the preclinical annualized change of left cardiac structure and systolic function. Nevertheless, more studies are needed to confirm the causal relationship between FPG variability and cardiac structure and function in the diabetic population. XXT and SHL analyzed and interpreted the patient data regarding the type 2 diabetes, and were the major contributors in writing the manuscript. JLZ, HZ and YLZ performed the echocardiography examination and collect the data. YTL, XL and LP collected the data and contributed to the introduction. BXJ and XXQ contributed to the reviewed/edited the manuscript. SHL, YMC and JLL made contributions to conception and design of this study and the edition of the manuscript. All authors read and approved the final manuscript. Ethics approval was obtained from the third affiliated hospital of Sun Yat-sen University Network Ethics Committee. Informed consent was obtained from all participants. This study was funded by National Key R&D Program of China (2017YFA0105803), the General Program of National Natural Science Foundation of China (81770826), the 5010 Clinical Research Projects of Sun Yat-sen University (2015015), the Science and Technology Plan Projects of Guangdong Province (2016A050502010), the Key Special Projects of Medical and Health Collaborative Innovation of Guangzhou City (201604020016), the Special Scientific Research Project of Guangzhou City (2060404), and the Science and Technology Plan Project of Guangzhou (201802010048). Additional file 1: Table S1. Baseline and follow-up cardiac structural and functional parameters in participants.